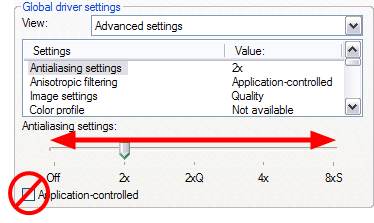 Use PBuffer for Picking: This will use an off-screen buffer for picking, resulting in a quicker response. This option should not be enabled if using a small capacity video card (32MB). The Full Scene Antialiasing is generated by your computer’s graphic card. It provides a smooth line display in OpenGL. This antialiasing will not only antialias your drawings but all the different views in the interface. Enable (Requires Relaunch) : By default, this option is off. Select to turn on the Full Scene Antialiasing option. You'll need to restart Toon Boom Harmony. Number of samples (For Mac OS): Enter the number of samples you want to be used for the antialiasing process. The number of samples is basically equivalent to the amount of time a pixel will be enlarged to calculate the antialiasing. This technique is called supersampling. The higher the number of samples, the better the antialiasing quality will be, but the longer it will take to calculate. The recommended value is 4. Enable Playback Caching: Enable image caching for OpenGL playback. Playback Cache Size (in Mb): Cache size in for playback images in Mb. Enable Textures in Pencil Lines: Disabling this will produce a drawing performance improvement in OpenGL views. Enable Variable Line Thickness: Turns on and off the rendering of the variable line thickness option of the Element Node. Enable Tone and Highlight: Turns the Tone and Highlight effects on and off in the Camera, Top and Side views. Enable Cutter: Turns the rendering of Cutter effects on and off in the Camera, Top and Side views. 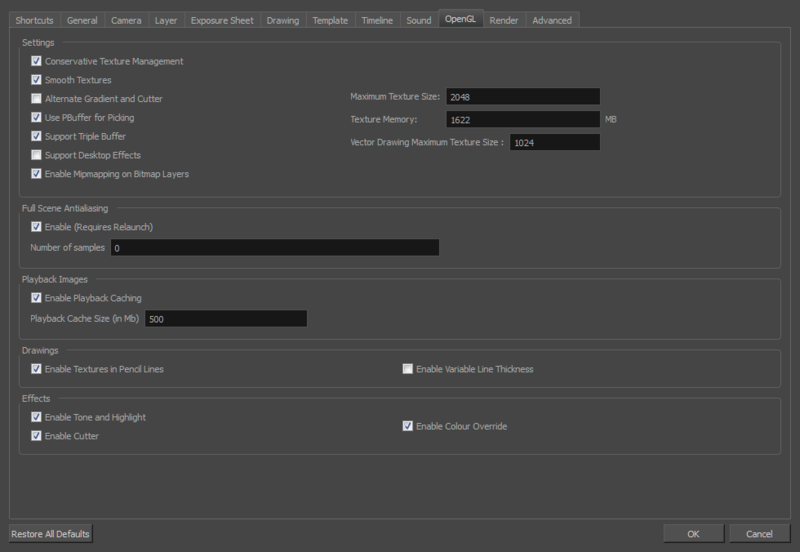 Enable Colour Override: Turns the rendering of the Colour-Override effects on and off in the Camera, Top and Side views.